A traditional pewter tankard featuring a large key-shaped handle with the number 21 embossed onto the top. This 1 pint capacity pewter tankard has a bright polished finish with double line design. It features a large key-shaped handle with the number 21 embossed onto the top. This tankard is manufactured in Sheffield specifically for County Engraving and features our unique touchmark: our guarantee of authenticity and quality. Our touchmark consists of our company initials, the minimum percentage of tin found in the alloy (92%) and part of the city of Sheffield's coat of arms as pictured. These tankards are made of the finest pewter and are handmade in the U.K. Pewter ware is made entirely by the skilled hands of a pewtersmith. No two pieces of pewter are exactly the same, minor variations, imperfections, marks and blemishes show the mark of each craftsman, reflecting the beauty of all individually made pieces. 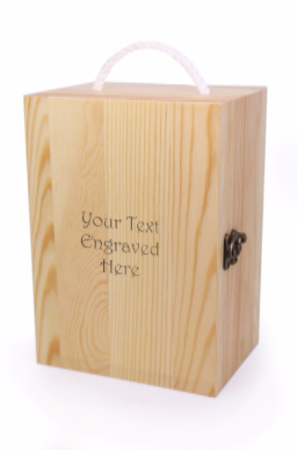 An extremely durable and stylish wooden storage box that protects and stores a tankard safely. It makes an ideal gift box for any occasion.